In many public places, there are special privileges which exist for individuals who have a handicap or disability. One of the most widely-seen privileges is the availability of special parking spots for people with special needs. In order to procure permission and allocation of specialized parking spaces for individuals with a disability, it is necessary that a disability parking form is filled with the accurate information about the subject and his disability. In the following collection, we give you an insight into the different types of Disability Forms. 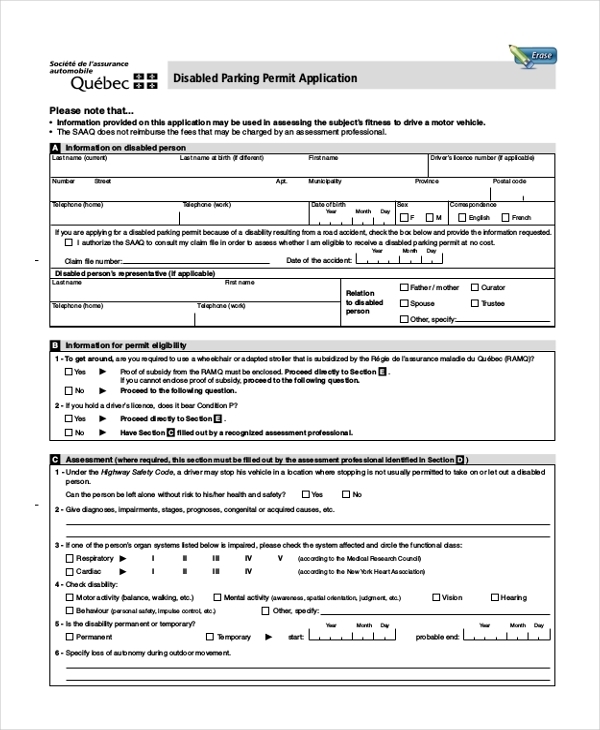 In order to get consent and space allocation for a disabled person, a disability permit parking form needs to be furnished with the appropriate information on the disabled person. Also, details about the disabled person’s representative (car owner accompanying the disabled) need to be included furthermore, results of assessment must also be duly mentioned. After review, the application is processed and approved, if all the fields and parameters are a match. In many public places, parking spaces have exclusive spaces which are specifically allocated for vehicles carrying a disabled person(s). When a disability car parking form is used, it is necessary to understand that this document can only be utilized if an individual’s medical condition is at par with the legal definition of disability to qualify for such a permit. A request for disability can be filled and filed when a car owner or his company is suffering from mobility issues and needs assistance while getting out of a car. The condition could be arthritis, foot disorder, cardiac and lung issues or wheelchair confinement. The details of the disabled person’s medical condition need to be elaborately described in a disability parking form along with the required medical documentation to serve as proof. The great thing about disability parking forms is that they are a great perk for people who are suffering from physical handicaps. Furnishing all the relevant details of the disabled person and their handicap with required medical proof can fulfill the process and help get a disability permit which can be utilized in all public parking spaces or in specified parking premises. 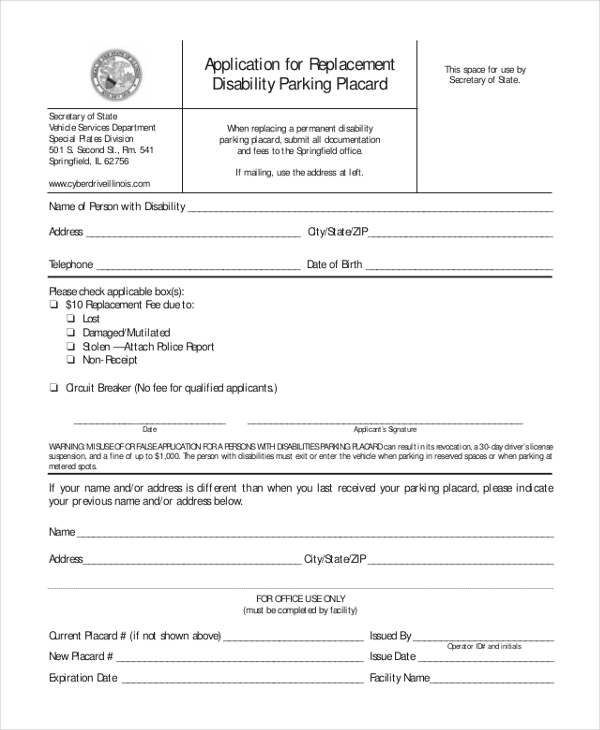 In order to apply for a disability parking permit, a disabled person needs to get his or her doctor to complete the disability statement section in a disability parking form. 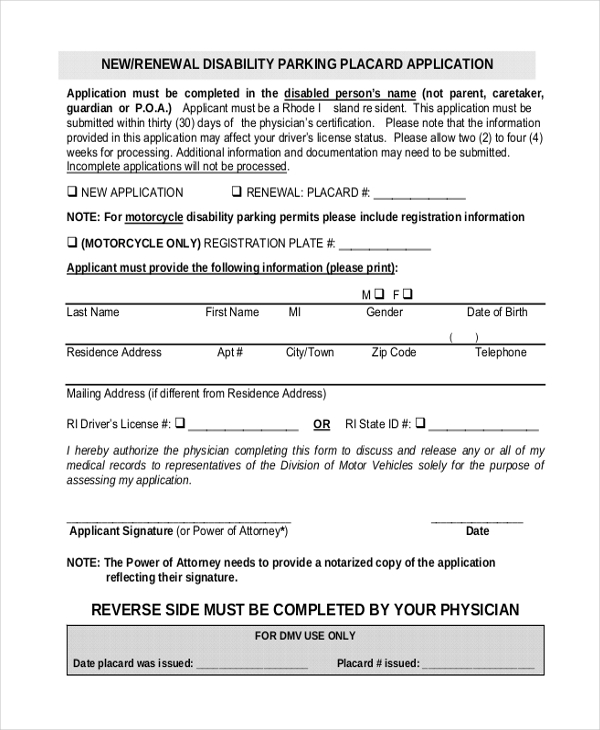 In many cases, a disabled person parking affidavit is also filed. 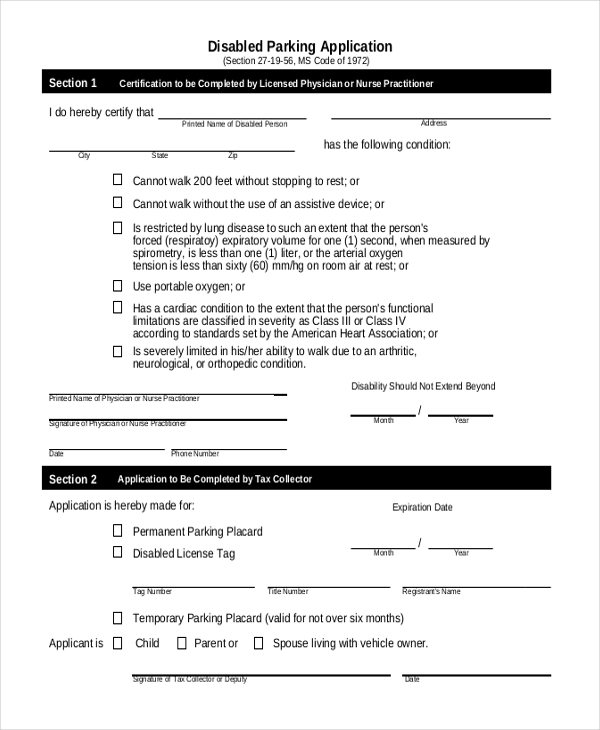 In such a document, the disabled person, who is also the vehicle owner, needs to populate all the fields with relevant details – also indicate whether the permit is for long term or temporal basis. Be it a new disability placard or a renewal of the existing one, an application form needs to be defined with relevant information and submitted to authorities. After successful verification and review, the applicant will receive a new or renewed disability parking permit. A disability parking permit comes into play when a car owner or his kin is immobile and requires assistance when getting out of a car vehicle. 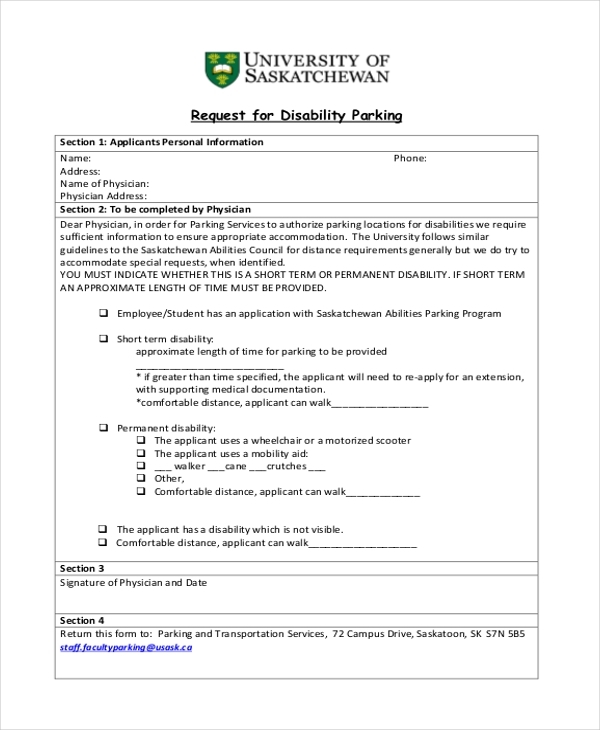 The disabled may be suffering from a medical condition or be wheelchair-bound, in either scenario, the applicant qualifies to apply for a disability parking permit. A handicap plate or disabled placard is very useful and helpful for patients with disability. It is a practical resource which offers mobility respite to patients. 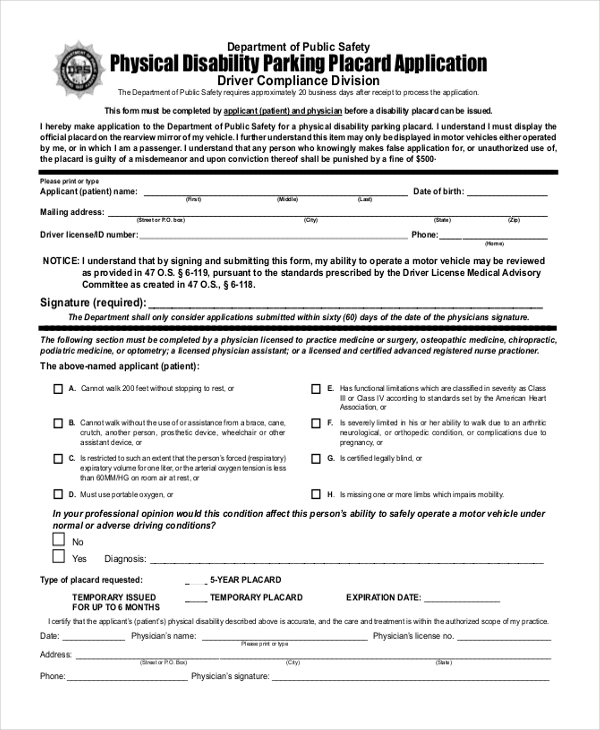 Whether a patient wishes to replace an existing disability or procure a fresh one, a disability parking form needs to populate with the required specifics and filed in with the concerned authorities. Many disabled individuals enjoy special concessions which benefit their medical condition. One of them is a disability parking permit. Like is the case with most permits, there is a procedure which needs to be followed to get hold of a disability parking permit. A disability parking form is designed for the initiation of the process. There are different special authorities who are designated to issue disability parking forms and permits. An applicant needs to get hold of a disability parking form and fill it with the necessary information and support it with medical documentation and making a submission to the authorities. Ideally, if all the specifics are accurate, a permit gets issued in no time. The target audience of disability parking forms is individuals suffering from a medical condition which requires them to have assistance while making any kind of movement. The design of the placards and plates may differ from state to state in a country, but they are all designed to cater to the condition of disabled individuals. 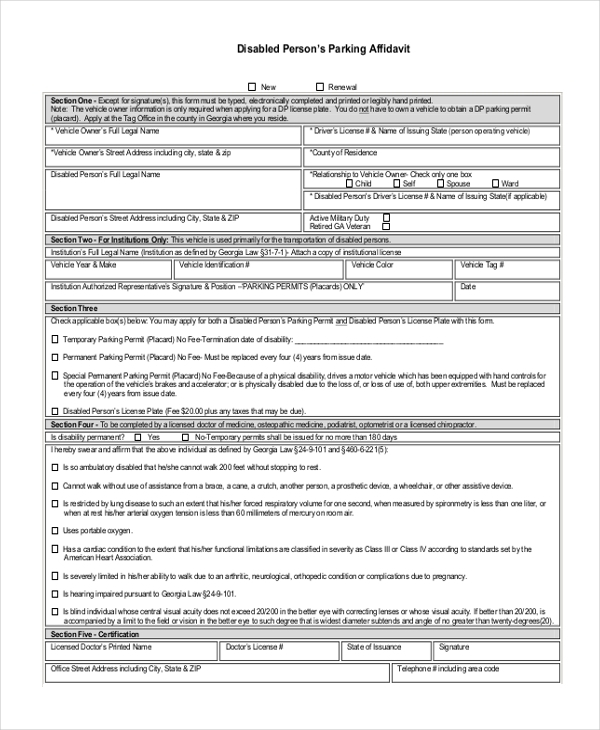 A disability park form can be filled by or for an applicant who truly and actually has a medical condition which qualifies to receive such a permit. A doctor’s disability statement is mandatory in a disability parking form. You may also see Disability Claim Forms. Where to Get Disability Parking Forms? Disability parking forms are easily gettable on the Internet. There are an abundant number of websites which have free samples. The samples are downloadable, editable and printable. As the forms are edit-friendly, users can customize the form and recreate a disability parking form. 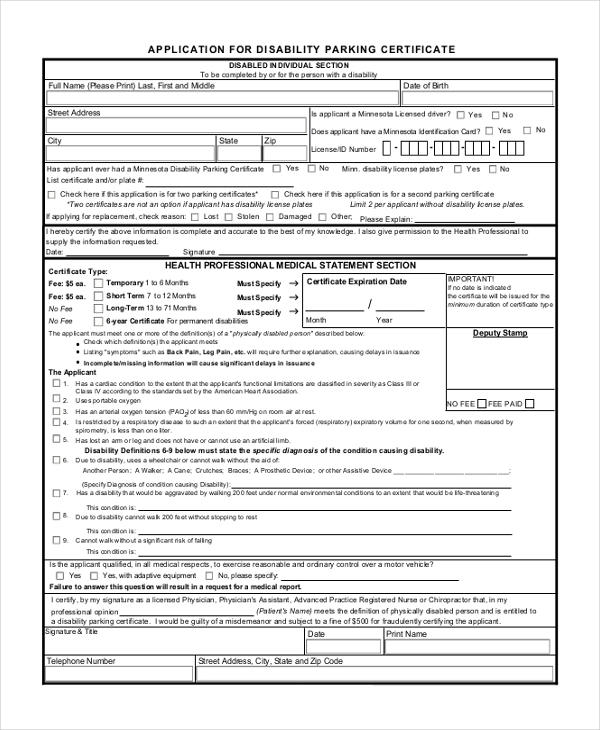 As far as original is concerned, the designated authorities usually have a form template on their official website. The form needs to be downloaded, populated and submitted on the website itself. You can also see Disability Application Forms. Disability of any individual is a serious matter and needs to be given due respect. Authorities work towards providing friendly amenities for the disabled, a disabled parking permit is one of them. Thankfully the existence and availability of disability parking forms ensure that the process falls into place in a smooth manner.